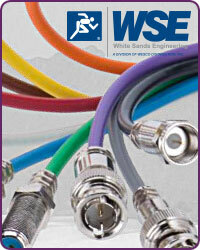 White Sands Engineering Cables and Connectors at HAVE, Inc.
White Sands Engineering provides outstanding HD connectors, bulk HD/SDI cables, cable assemblies, and tools for broadcast, CATV, RF, and AV applications. They specialize in 75-Ohm, Mini RG59 cables and connectors that feature excellent performance in innovative, one-piece designs. In addition, our in-house custom cable shop can build custom jumpers for you with White Sands spec'd parts! If there is a White Sands Engineering product you need that you don't see here in our store, just send us an e-mail or call us at (888) 999-4283 and we'll get it for you!